Nothing warms up your body and soul like a dram of whiskey…except maybe a hot dram of whiskey. 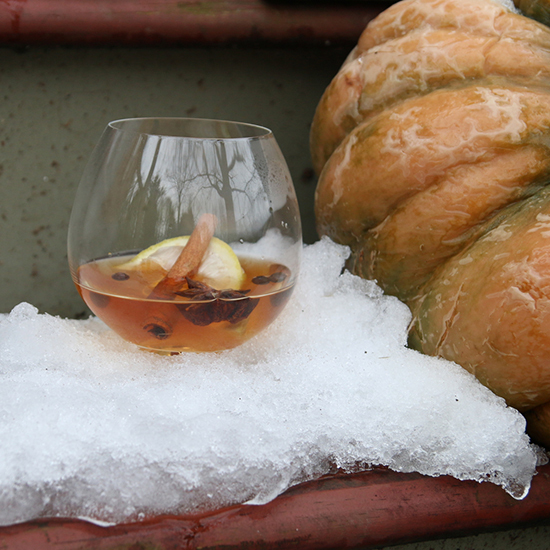 This time of year, we're thinking about hot toddies every time there's a chill in the air. The classic toddy—bourbon, hot water, honey, and lemon—is comforting and easy to love. And with its unrivaled ability to warm you from the inside, you can just about consider it medicine. And there’s nothing wrong with sipping a little medicine on a winter afternoon, right? We're all about the standard whiskey toddy, but the drink is also a great template for experimentation. Only have rum? No problem. Tequila in a toddy? Believe it or not, it works. Here are three hot toddy renditions to get you through the winter, from the conventional to the much less so. Bourbon, honey, lemon. Start with the standard toddy and play around with the garnishes like cinnamon sticks, star anise and cloves. Since the steam off the toddy lifts all the aromatics straight to your nose, the whole spices are key here, just as they'd be in a hot cider or mulled wine. Instructions: In a heat-safe glass, stir together 2 ounces of bourbon, 1/4 ounce of honey syrup (equal parts honey dissolved in hot water), and a dash of Angostura bitters. Pour 2 ounces of hot water over the top. Squeeze in a big lemon wedge and add it to the drink, and garnish with any winter spices you'd like: a cinnamon stick, star anise, cloves, allspice berries, and whatever else you fancy. When you think of tequila, it's probably in an icy margarita. (Preferably on a beach. In Mexico.) And while Jalisco isn't exactly known for its frigid winters, tequila takes quite well to the toddy form. Definitely use a slightly aged tequila here, smoother and with a bit more weight; it'll be noted on the label as a reposado. Instructions: In a heat-safe glass, stir together 2 ounces of reposado tequila (we're fans of Patrón Roca), 1/2 an ounce of agave syrup (equal parts agave dissolved in hot water), and a dash of Angostura bitters. Pour 1 ounce of hot water over the top. Squeeze a lime wedge over the top, and garnish with a big cinnamon stick. Good aged rum, with its rich, complex sweetness, takes particularly well to heat; we're barely adding any water here, though if you're looking for something a bit mellower, feel free to dilute to taste. Don't skip the lemon wheel. It may look like just a garnish, but its aromas will be unleashed as soon as the hot drink hits it. Instructions: In a saucepan, gently heat 2 ounces of aged rum, 1/2 ounce of raw sugar simple syrup (Sugar in the Raw or similar, dissolved in an equal part hot water), 1 dash of Angostura bitters, and a 1/4 ounce of water. Slowly heat until just warmed through. Place a lemon wheel in a heat-safe glass and pour the warm cocktail over the top.